The Tristar marked Lockheed's return from its commercial exile since the ill-fated Electra. The aircraft was easily the most technologically advanced of the three initial widebodies but this led the programme into massive cost overruns and technical issues, not to mention the near collapse of its only engine manufacturer Rolls-Royce. Due to all these issues and delays the programme was overtaken by the less advanced but simpler DC-10, which to add insult to injury had engine manufacturers that could afford to invest in new engines giving the DC-10 a range advantage over the Tristar that wasn't closed until it was far too late. In the end only 250 Tristars (of all variants) were built, however large orders from Delta, TWA, Eastern, British Airways and All Nippon meant the Tristar remained an important type well into the 1990s. NOTE: This review does not cover the shorter Tristar 500, which will be dealt with separately. It should be noted that nobody in 1/400 scale has attempted to create a Tristar 200 mould, which isn't too surprising as only 24 were built. The PSA releases also do not faithfully detail the extra underbelly lounge additions either. So let's take a look at the moulds, as always, in date order. Gemini were first to market with a Tristar 1 mould but rather failed to take advantage of their lead and only ever produced 20 models using it. Another was re-released as a Schuco and Sovereign made a single Gulf Air example. Sovereign was apparently a Gibraltar based company, which used Gemini and SMA moulds to make mainly aircraft that visited Heathrow in the 1980s. They only ever made 19 models (mostly DC-9s) and this Tristar was their only one. I think Black Box may have also commissioned an Eastern Tristar too. This was one of Gemini's first moulds and a couple of the earliest examples have incredibly rudimentary landing gear legs - sometimes without any nosegear doors too. That's a shame as the mould itself is not bad. Despite its age the paucity of good Tristars means some of these (ANA and Cathay especially) can still go for very good $$ if you can find them. Tail - Early Geminis are plagued by seams and the Tristar mould is no different with a really obvious one under the horizontal stabiliser. Gemini would get rid of these as it modified its moulds but since the Tristar didn't get any use after 2004 they didn't bother with it. The shape of the tail seems ok but the tail join is unsightly and the sculpting around the middle engine at the front sides is incorrect. The exhaust is the worst part. It is clearly missing a bit and doesn't look like its fits the mould well, plus the shape of what is there is wrong - 2/5. There's obviously something about the Tristar as Dragon, who usually made a decent range with their moulds, used their own Tristar mould only 6 times! They did at least use it to make some examples Gemini never did, in fact there is almost no overlap (aside from a Cathay example). This does mean however you stand no chance of ever standardising your Tristar fleet. This mould is inferior to the Gemini at the nose end but superior at the tail end. It is also seamless, which is a big plus. Dragon's lack of use of it is puzzling and infuriating. Who exactly Blue Box were is rather lost in the sands of time. They were one of a number of brand names used by somebody with access to a 747-200 mould and were associated also with other fly by night brands such as Netmodels, C&C and Magic. They did however strike out on their own with a Tristar mould and were prolific. Not only that but Jet-X also used this mould quite widely too. This is a shame as the mould is sub-standard and yet its existence has been used as a reason for the Tristar not being tackled seriously since by anybody else. This is a major disappointment as even if the Blue Box mould was any good it was produced in only small runs per model and they are hard to find. One innovation for this mould is that the engines come with removable engine covers. Basically if you have an at all representative collection of Tristars you're going to have to bite the bullet and accept this mould. Having said that I doubt there is anyone who wouldn't get rid of them ASAP if a new Tristar was made. I should also note that Blue Box had a silly tendency to also release chrome and gold plated versions of some of the models. God knows who wanted one of these! The last best chance for the Tristar was from the unlikely source of the Witty factories. Some of their moulds appear to be rip offs of others (707 for example), whilst others are just middling (DC-10, 727) but the Tristar is along with their 747-200 their crowning achievement. It is quite shocking and appalling therefore that it got used a total of 11 times before Witty stopped production in 2014. Let's face it the collectorate want Tristars, this mould exists and is awesome and yet we can't get any made. I believe since Witty's end all their moulds have gone into the huge back catalogue owned by JC Wings. Whether any ever find their way out nobody knows, but it isn't looking promising. 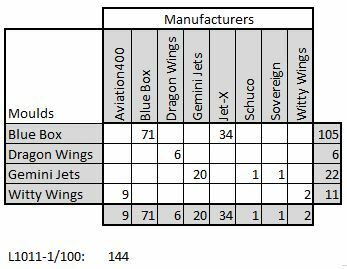 Most of Witty's production was under their Aviation 400 brand and the output consists of a really random selection of obscure airlines like Air Ops! Only the Saudia release could be said to be a major Tristar operator. This is the last of a series of missed opportunities for the Tristar and possibly the worst example of waste I can remember in this scale.